Amalia Euphrosyne Lindegren was one of Sweden’s most popular 19th century artists and painters. 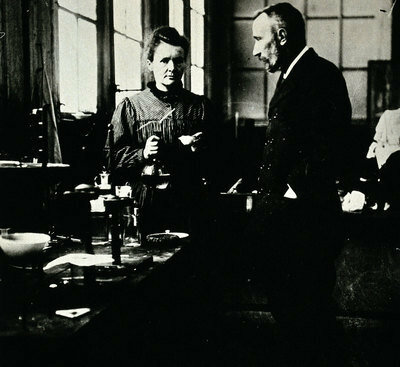 She was the first Swedish woman to be awarded a scholarship to study art abroad. In this chapter, we follow this quietly modest and brilliantly talented artist, as she rises from humble beginnings in Stockholm to become a celebrated portrait painter of the elite. Lindegren was born in Stockholm in 1814. Her mother, Anna Catharina Lindegren, died when Amalia was just three years old. Anna was married to caretaker Anders Lindgren, but he was not Amalia’s father. 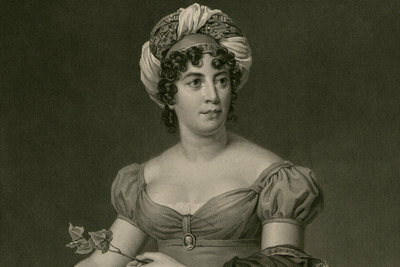 Following her mother’s death, Amalia was adopted by the wealthy widow of her alleged biological father, the nobleman Benjamin Sandels. 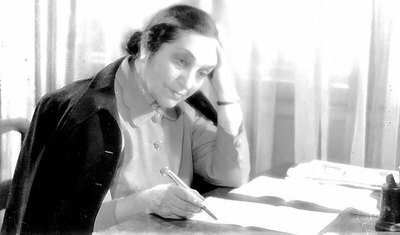 As the daughter of a poor mother adopted by a rich family, she received an education typical of that for an upper-middle-class girl, including learning French, music, and most importantly for Amalia, drawing. 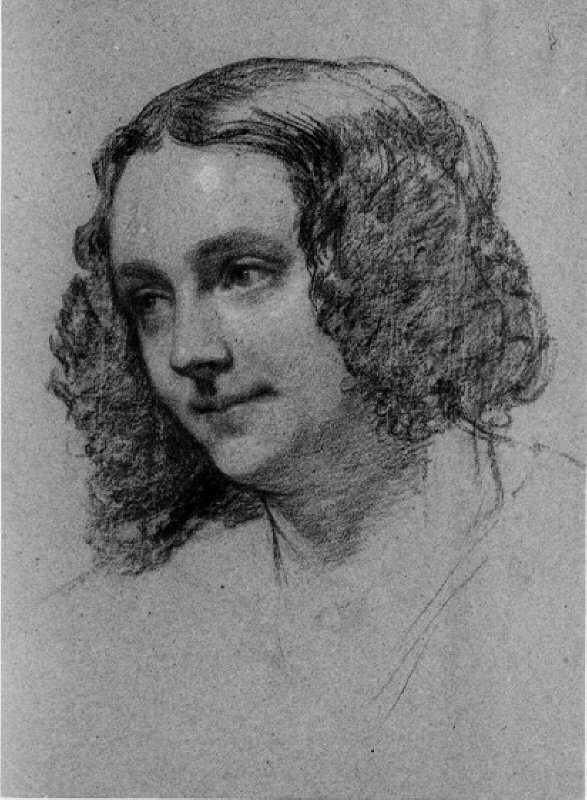 As a young woman, Amalia’s portraits - simple pencil, chalk or charcoal profiles - impressed her family and friends. Throughout the 1840s, Amalia’s artistic education developed. 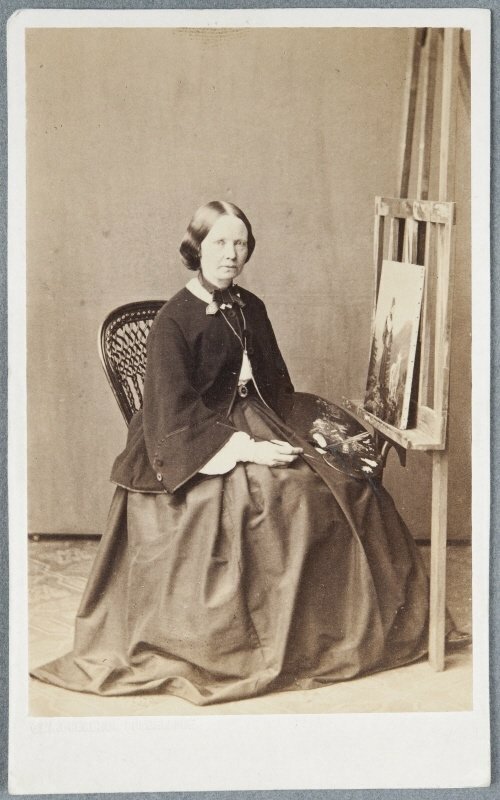 In 1842, she enrolled in a drawing school, becoming a student of another female artist, Sofia Adlersparre. 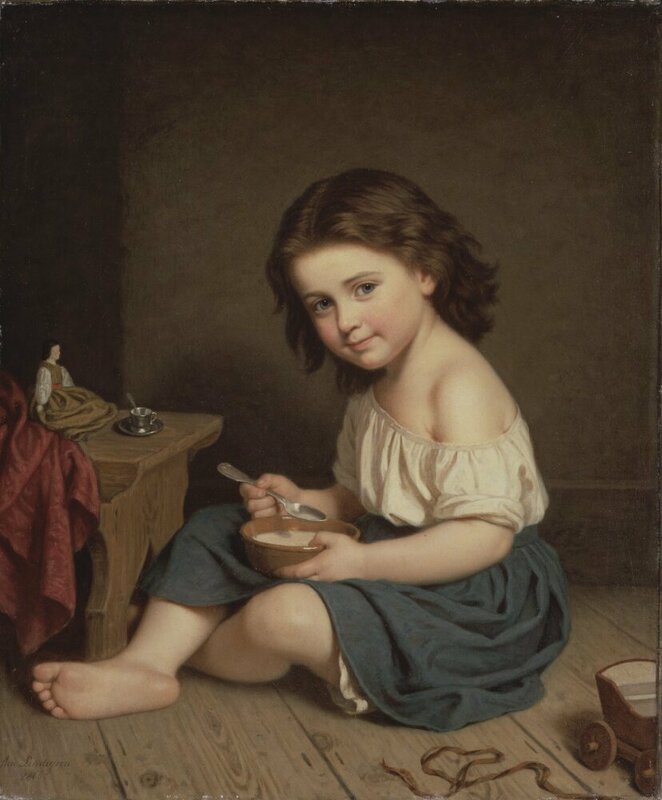 The sculptor Carl Gustaf Qvarnström, who taught at the Royal Swedish Academy of Fine Arts, took a great interest in Amalia’s work and wanted to develop her talents. Up until that point, the Academy - the only school of art in Sweden - did not admit women as regular students. In 1847, Qvarnström was able to get Lindegren admitted to the Academy’s Lower Antique School as an ‘extra student’. There, Amalia studied for about two years, honing her portraiture skills by drawing from plaster casts of antique sculptures. However, she was not allowed to attend life classes. It would be another decade and a half before women were accepted as regular students. After exhibiting portraits, Lindegren was appointed as an associate member of the Royal Swedish Academy of Fine Arts in 1850 (and a full member several years later). Throughout her education, Amalia was one of only a small number of female students. 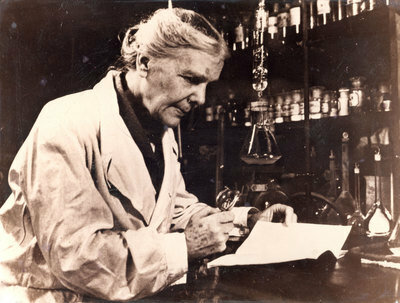 At the Academy, she studied with 30 men but only up to five other women. 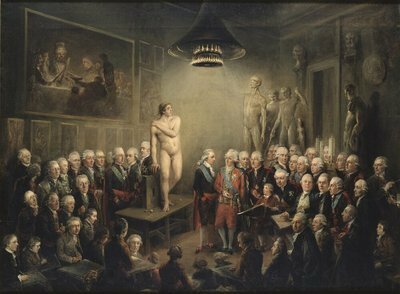 A 1782 painting by Elias Martin of the Academy shows what a male-dominated environment the Academy was. In 1850, she became the first Swedish woman to be awarded a scholarship to travel and study art abroad. Making the award, the Royal Swedish Academy of Fine Arts deemed that Lindegren was an independent artist who pursued her studies seriously and assiduously. 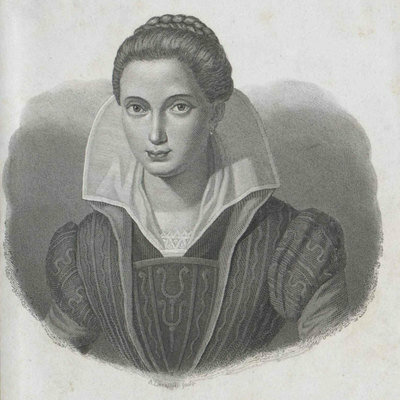 However, although Amalia was 36 when she was awarded her scholarship, she was an unmarried woman and so deemed, according to Swedish law, a ’minor’ incapable of managing her own affairs and who therefore needed to have a chaperone. Travelling outside Sweden, Amalia’s journeyed to Paris, the international art capital of the era. There, she expanded her repertoire to include genre painting – scenes depicting ordinary people going about their everyday life. She also spent time in Germany. In Munich, she became involved with an artistic circle associated with historical painting, and in Dusseldorf with an influential centre for art, whose artists were interested in painting folk customs and costumes. Producing artworks was an important element of the scholarship. 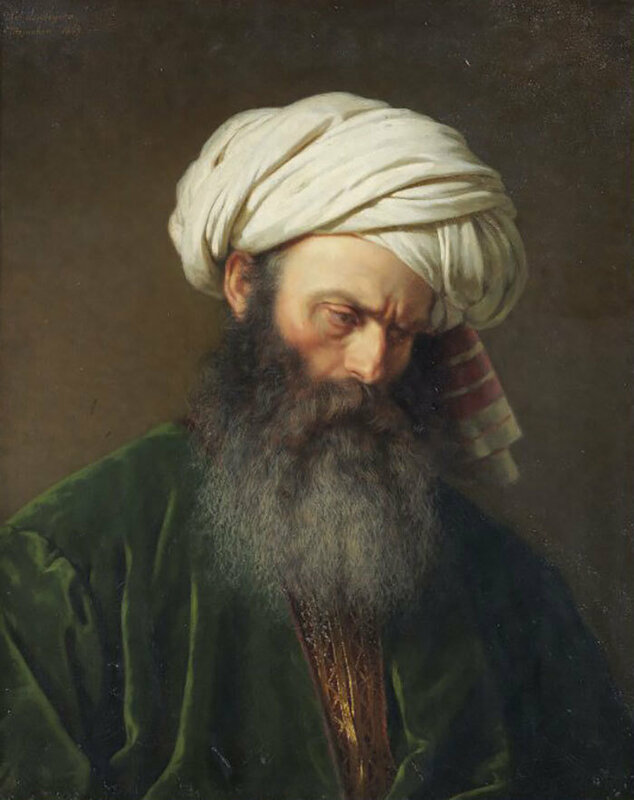 Lindegren wrote to the Academy of Fine Arts to inform them that she had completed a painting ‘depicting a man in Turkish dress (head and shoulders)’ in Munich in 1854. 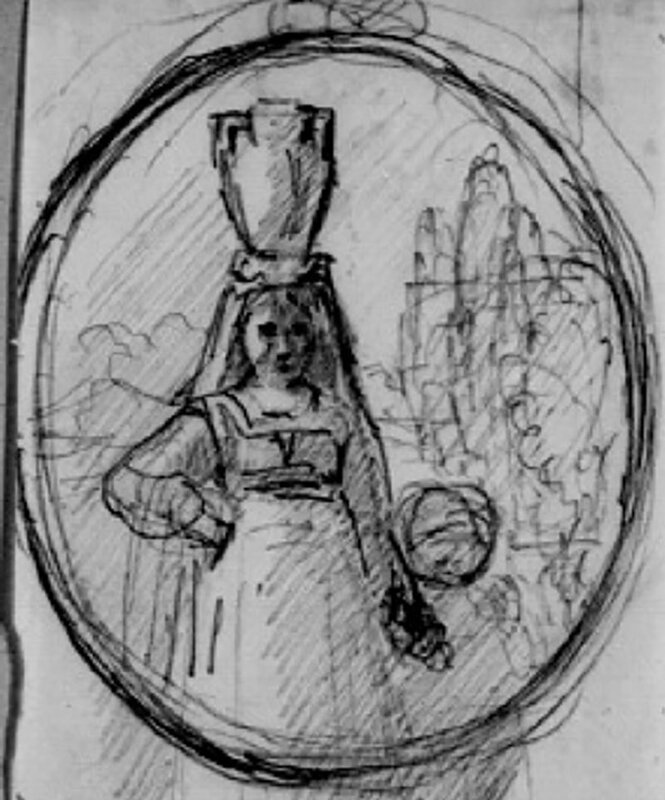 She also spent time travelling through Denmark and visited Italy, studying in Rome in 1854-55. 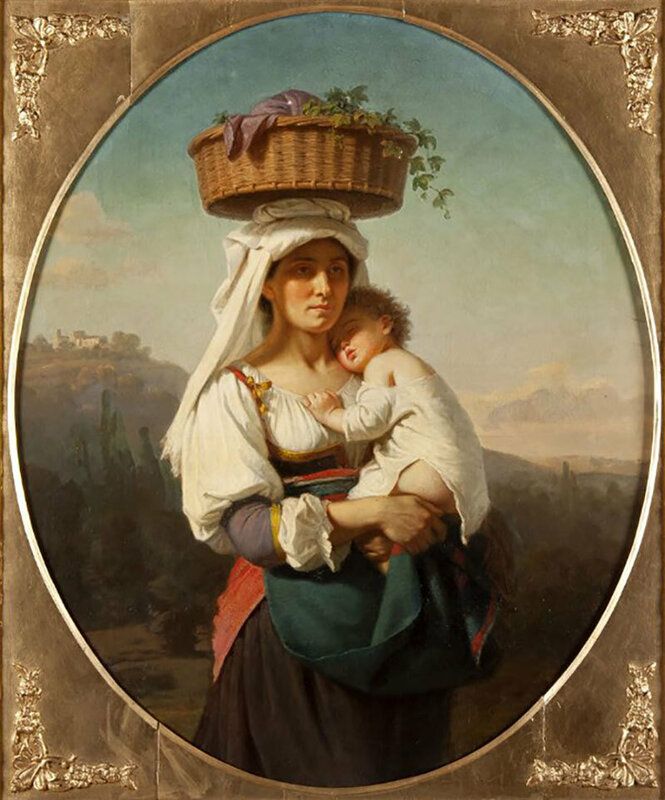 In this painting, we see not simply a portrait of a woman with a child, but a motif that was very popular in Italy. The painting is an example of how artists portrayed an idealised image of Italy as a place where people led simple and timeless lives. Amalia returned to Stockholm in 1856 and continued to live an independent life. 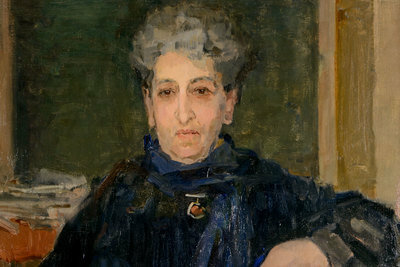 She rented a studio and tried to establish herself as a portrait painter, a secure way for an artist to earn a living. The versatility of Lindegren's artistic skills can be seen in the work she produced in Stockholm. She was commissioned to paint portraits of Stockholm and Sweden's high society. In 1859, Amalia painted portraits of the new king and queen, Carl XV and Lovisa. 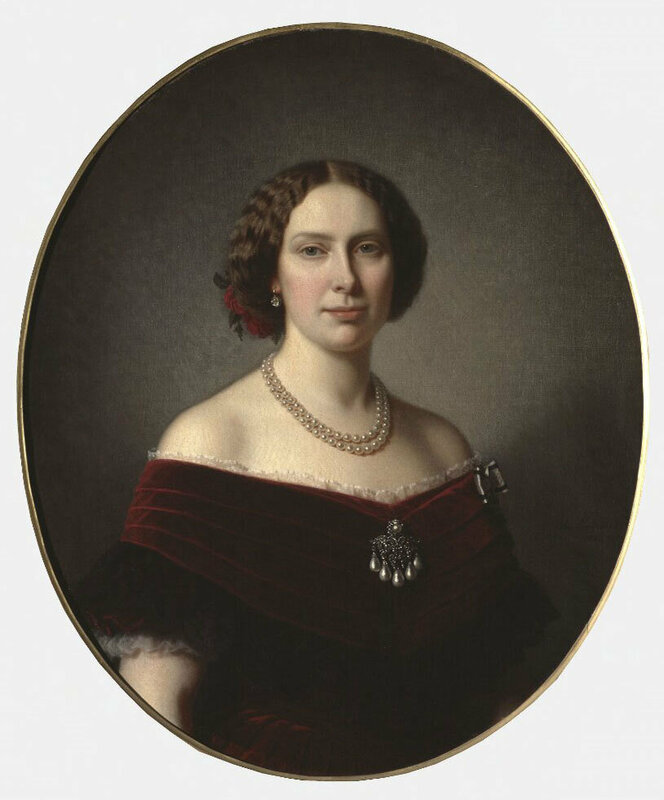 Royal commissions continued, and in 1865 she painted a portrait of Sophia, the king's sister-in-law. Many of these fashionable portraits were reproduced in newspapers and magazines, bringing fame to the name Amalia Lindegren. In addition to portraits, Lindegren liked to paint sentimental paintings with motifs taken from everyday life. In 1857, Amalia took a study trip to Dalarna, her mother’s home province in central Sweden. She was inspired by the people, their clothing and traditions, and created idealised paintings which celebrated their peasant way of life. Her painting Lillans Sista Bädd from 1858 became one of the most well-known paintings in Sweden at the time - it shows a peasant's cottage, where a family mourn their deceased infant in a cradle. 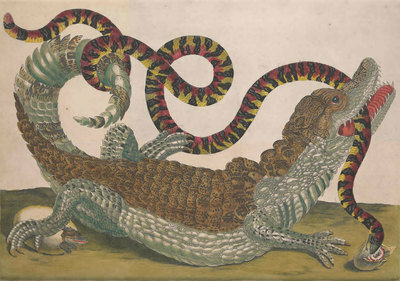 Because the subjects and motifs Amalia chose had broad appeal, her paintings were very popular and were reproduced countless times as lithographs. Here, she paints a typical Sunday evening domestic scene. 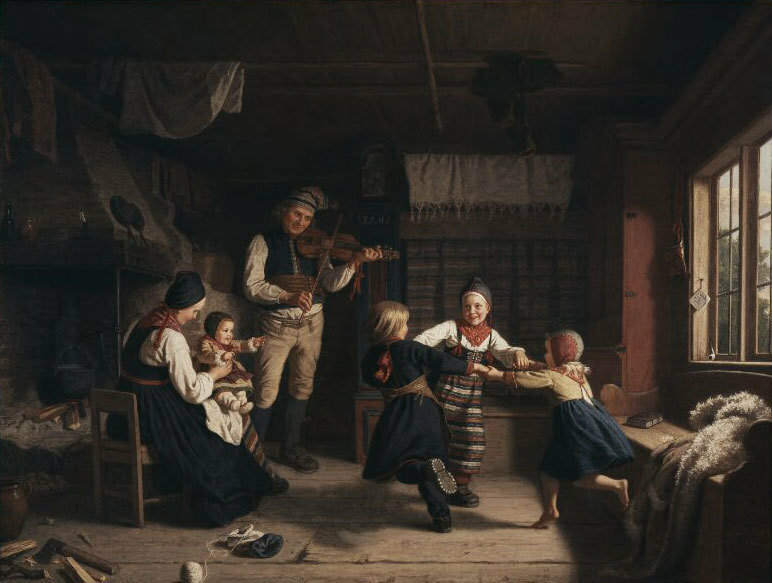 The father of the house plays violin while the older children dance in a ring and the mother sits with the smallest on her knee. 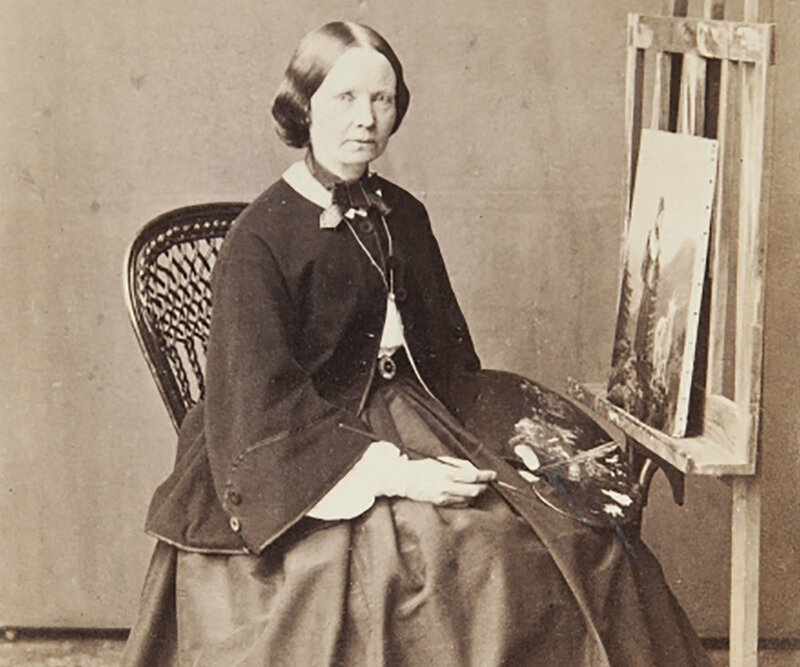 Amalia's paintings were exhibited around Europe: in London in 1862; Dublin, 1865; Paris, 1867; and Vienna, 1873. They even crossed the Atlantic and were exhibited in Philadelphia in 1876, and in Chicago in 1893. She was known for her devotion to her art. During her time at the Royal Swedish Academy of Fine Arts, Lindegren usually signed her pictures, a courageous act indeed at a time when most women were listed in the catalogues as ‘Anonymous’. In the 1860s, her artistic success was seen as an inspiration to supporters of women's rights and a strong argument for eventually admitting women to the Academy.